In the past decade, Julie Zhuo has become one of the most admired product designers in Silicon Valley. If you’re not already familiar with Julie from her must-read essays on Medium, you surely know her work. Now in year 10 at Facebook, she’s had a direct hand in crafting the content of your Newsfeed, the ways you Like and React to posts, how you share photos, and much more – all while climbing from an engineering internship to VP of Product Design. I recently caught up with Julie for a wide-ranging chat about why you need controversial design principles, why there’s no ideal ratio of designers to engineers, and why impostor syndrome is more common than you think. Good design is the creation of an experience that’s enjoyable, useful, easy and accessible – but it’s difficult to add functionality without increasing complexity. The right design choices are rarely obvious to designers themselves, but they should feel obvious to the end user. When it comes to product team building, there’s no ideal ratio of designers to engineers. It shifts depending on where you are in achieving product market fit. Strong design principles should be controversial, because they should explain why your company made a decision that another wouldn’t. When two products accomplish a job with relatively similar ease at a similar price, the ultimate differentiator will be how the product makes the user feel. Design plays a huge part in that. Adam Risman: Julie, thanks so much for joining us. You just reached your 10-year anniversary at Facebook. Congratulations on such a big milestone. How has your role grown and evolved in that time and what are some of the bigger products within Facebook that your work has most closely aligned with in that time? Julie Zhuo: It’s been definitely a wild journey. I actually started as an engineering intern. I believe I was Facebook’s first intern, so I had just graduated from school. I loved the environment and decided to convert to full-time after just a couple of weeks. As an engineer, I was working on a lot of front-end products, but I had a lot of interest in design. I didn’t even know it was called design; I hadn’t studied it formally. Growing up, I had done a lot of web design on my own. I loved digital illustration, I was always in Photoshop in my free time. The earliest project I worked on was photos, and then I worked on the first version of Facebook platform – how you log into other services using Facebook. We were one of the first website applications to pioneer the third-party login. I’ve worked on a lot of the core parts of Facebook over the years, things like News Feed, the Like button, and videos. Now what I do is I oversee what we consider our core Facebook app. This is basically the experience that people have when they open Facebook. They see News Feed, they share, they see different kinds of content, and that’s the space that I oversee design for today. Adam: The transition to management is always challenging regardless of the field. What’s the biggest challenge been for you in that process and how involved are you today in the design details? I really believe that in order to build a great team or a great company, it’s about spending more of your time as a manager thinking about the environment that enables other people to be successful. That’s a transition of figuring out how to let go, and luckily I had a number of years where I was managing a smaller team. I was able to still do some product design work on my own. Then as time passed the team grew larger so I had to learn how to give up more and more of that and empower individuals on my team. You fast-forward a couple years and then it was about managing managers and coaching managers, who then are managing the individual designers. It was always a process of figuring out what is the most important and leveraged thing I could be doing, which in a lot of cases, isn’t making the product decisions myself. But it is in figuring out how to hire great people, how to have a great process so that people are focused on the right things, and about communicating and making sure everyone’s aligned on what’s important. 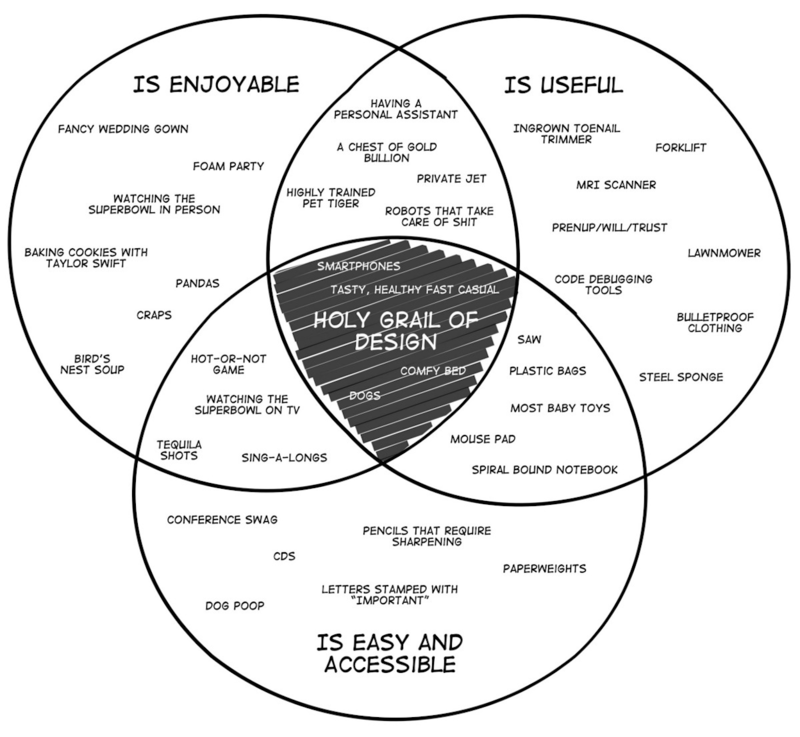 Adam: In one of your recent Medium posts you created an infographic describing the Holy Grail of good design as the creation of an experience that’s enjoyable, useful, and also easy and accessible. That’s got to be extremely challenging at Facebook, because you’re designing for more than one billion people across the globe and they all have different contexts and definitions for what those things mean. How do you stay true to that concept while designing for an audience that really doesn’t have an average user? Julie: We had to give up on the concept of an average user many years ago, when it stopped being people that were like us – like college students or recent grads – and it started to become more global and to include people in places that we had never been to and couldn’t understand their lives. We make it a big focus of ours to try and understand our global community better. We built up a really wonderful research team over the years. Now we have teams that work on the product and are focused on markets like India or Latin America, because they’re very different markets. Julie’s “Holy Grail of Design” – See her full post on Medium. At any given month, there’s a bunch of engineers, designers, and researchers who are in India or in Brazil, and they’re talking with people who use Facebook to ask question and understand their problems, their needs, how they go about their days, and what opportunities we have to try and build products that make their lives a little bit better. Research is a huge part of our process now. In my heart of hearts, I believe that it’s possible to have a product that introduces more and more power and has more and more different functionality in a way that doesn’t increase complexity, that’s a hard thing to accomplish. There’s a lot that we need to do to continue to be better in that respect. I don’t think that it’s completely at odds, that you can’t have something be powerful but also have it not feel super complex. One of the best examples of the ways that we’ve done that at Facebook is News Feed. Our goal with News Feed is to make sure we surface the most interesting content for you, to try and make that as personalized and as interesting to each individual as possible. That means everybody’s News Feed is different. I’m into design, I’m really catching up on the Warriors and how they’re doing, so my News Feed is filled with content about that. Of course, I have different friends than you do. My experience is extremely tailored to me and we’re trying to make that experience better and better. That can extend to the ways that we think about a lot of our other products as well. Adam: There’s a great story that you’ve shared about your first design job and internship at Microsoft OneNote. One day there Chris Pratley told you something that essentially boiled down to you, “Good design feels obvious”. What does that mean to you and why has it stuck with you all this time? Julie: It felt like such a simple thing to say and he actually followed up with, “It’s obvious when you see the solution, but it isn’t obvious to come up with that solution.” You can try for many months and you can try a hundred ideas, but you know it’s the right one when you show someone and they’re like, “Yeah, of course”. It’s not about the “aha” insight that nobody else could ever seek. It might be hard to come up with that insight but a lot of times the right solution for people just feels right. It doesn’t mean they have to learn something completely new. You use it and you know it’s right and you don’t have to do a bunch of explanation around why this is good or why it’s better. I think about that a lot because the process when we build products is quite messy and never seems obvious. The path that you take, it’s sometimes not clear where to go next. I sometimes see teams get caught up in this situation where they feel so constrained – they have this idea and it’s almost like they’re trying to figure out how to defend the idea. They’re saying, “Well, this is the best idea because X, Y and Z”, and everybody else in the room is trying to give some arguments for why this doesn’t feel that great. To me that automatically short-circuits into if people who use the product can’t all agree that this actually feels good, then it probably isn’t the ideal thing. Perhaps it’s the ideal thing given the constraints that we have or given the way that we’ve positioned it, but it doesn’t strike me as “this is actually the right solution”, because if it were you would be able to give it to a bunch of people and they would say, “Yeah, that totally makes sense”. Adam: Facebook takes a very collaborative, multi-disciplinary approach to team-building. You’ve got product managers, designers, engineers, all working alongside each other. Is there an ideal ratio for designers to engineers, and what can they learn from each other? Julie: Recently I was at a dinner with a bunch of other design managers at various companies and we were talking about this ideal ratio. Sometimes it’s four engineers to designers, sometimes it’s ten. It’s so contextual, based on the project. Certain projects are much more about the experience and the surface that the user is interacting with than others, and that determines the correct ratio. You can contrast a project that’s in the conceptual stage where you’re trying to find product market fit and therefore you’re going to do dozens of different explorations with different models and different ideas and that’s going to be a much more design-heavy process up front. If you have a product that’s got great product market fit and you’re making a bunch of optimizations to try and make it work better, it might require fewer designers compared to the number of engineers. There’s no perfect ratio. It really depends on the problem need and how much exploration and design work does it requires. Adam: Right. Facebook is known for shipping so continuously and so fast. Do multidiscipline teams help with that or does shipping more difficult? Julie: What you want is the team to really own the problem that they’ve signed up to solve and to have each member of that team feel very invested in that problem and being able to work their way toward a solution that would successfully solve that problem. This is what binds everyone together but you’re going to have different perspectives. You’re going to have people who are thinking about different ways to best accomplish that, and it’s the push and pull that ultimately results in the best product. I get a little bit concerned if teams are always in agreement 100% of the time because then you’re probably not getting the kind of discourse and debate that actually gets the product to shift until it’s actually better. There’s a lot that each discipline can learn from each other. Adam: You said earlier in your career that you were a skeptic of design principles but since have come around to them. How crucial is it for a startup to establish a clear set of design principles early and what are some examples that are more meaningful than obvious? Julie: A lot of the purpose of having design principles is to really align people around what matters. What is unique about the way we as a team, organization, or company think that might be different from the way other companies think? You don’t go and find two companies that are exactly alike. A good set of principles encodes that so everyone can have this shared sense of what’s important for us and what’s true to us. When new people join or when your company’s scaling, then it becomes easier for them to understand those things that are so unique and so important about the way that you do things and what you value. If you’re two people or three people and you guys are talking every day and you have a complete mind meld, you need to spend a couple hours just to write it out. Or maybe it’s not a problem and it doesn’t do anything at that point. At the point you’re growing and now you’ve got 20-40 people, then it starts to become a little bit more important to try and encode your principles for your product. I go back and say, it’s not just about producing the list, it’s not just about, “Hey, look, we’ve got some design values”. What is, again, unique when push comes to shove? We could come up with all sorts of things that are going to feel good. We care about simplicity, and we care about people. When push comes to shove and you have to make a trade off, how are you, in those moments, as a team or a company going to prioritize? What are you going to care about the most? Good values will be controversial in that respect because it’s something that another company might have made a different decision than you. Adam: As companies begin to scale and hire, many of the founders or people that did the hands-on design work eventually have to make big bets on new, early hires and hand those things over to people who can share in their vision. What key traits do you see in a young designer that makes you think, “I can take a chance on this person and give them a shot here”, and how do you set them up for success? Julie: In looking at a young or earlier career designer, probably the most important traits are self-awareness and and proactivity. Self-awareness means a person is reflective and understands where they are, thinks about where they want to go, knows the skills they’re stronger in and those to continue to develop. I find that if you have the self-awareness then you also then have the proactive drive to learn and get better in your skills. That equation translates three years down the line. You’re going to be awesome, you’ll have learned all the stuff, you’re going to not be afraid of new challenges and you’re going to continually be able to grow with the team or with the company. Those are the things I think are most important. Adam: One thing you’ve written about in a way we can all relate is the idea of the imposter syndrome. Why do you think it is, as you wrote, that insecurities never fully disappear, and is this especially true for women in male-dominated fields? Julie: There’s data that shows this is something more true for women. For example, when reading a list of job requirements, women will only apply if they think they meet 100% of those requirements and men will apply, on average, if they meet 60 percent. We now have evidence and a bunch of studies and surveys to indicate there are things that tend to hold women back. On the subject of the imposter syndrome, I do think that everyone goes through it and the reason why it never fully disappears is nobody is perfect. We’re all failing in some respects and we will continue to. There’s no point where you say, “Cool, I’m done failing at stuff in my life, everything I do from here on out is just going to be successful”. Adam: It sounds unhealthy if you’re thinking that way. It’s part of the human journey to feel this way, and it’s not like you can expect it’ll go away, so we have to try to adopt tactics to help us deal with that, so when we do feel like we’re failures, there’s tactics we could use to help bring ourselves out of that and acknowledge that it’s not just me – I’m not the only one who’s feeling this way or that, I’m the only one who can’t figure out what’s going on. That’s a universal thing. Adam: At Intercom we talk a lot about the Jobs-to-be-Done theory and believe that people primarily use products to get a job done. They make a switch because another product will do something better, easier, faster, etc. You’ve said that in the future you think products will be used because because of style and how it makes someone feel, not because of necessarily utility. Could you explain that? 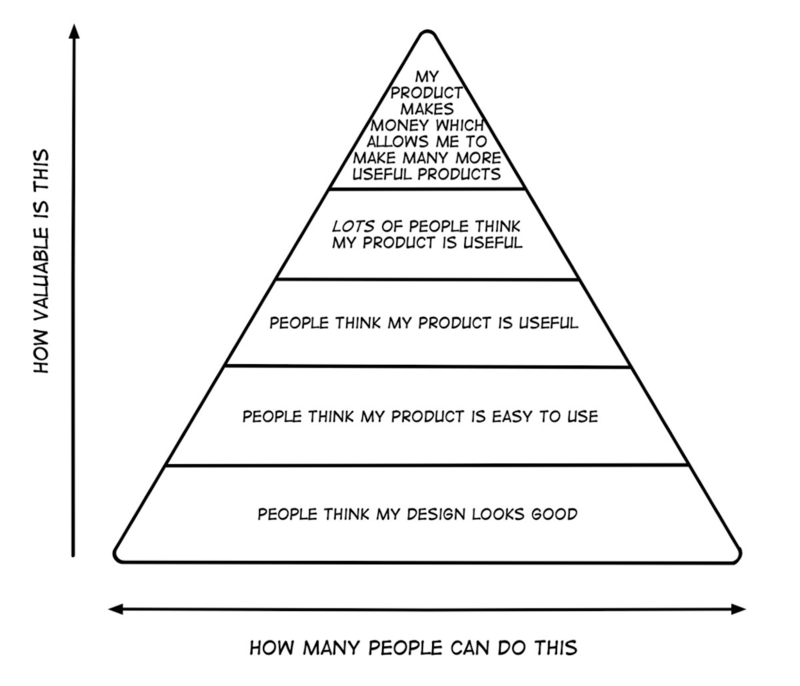 Julie’s “Ambition Hierarchy for Designers” – See her full post on Medium. Adam: I love that fashion metaphor. It makes it so relatable. Julie, thank you so much for joining us today.